Where are the Stormwing Plane timed trials? And, when you get there, how do you complete them? We’re hoping you’ve got your piloting stripes when it comes to this task as part of the latest batch of Fortnite challenges. Your goal is to get your skills up to snuff enough to complete three timed trials with the X-4 Stormwing plane. This winged monster is the first aerial vehicle that has made its way to Epic’s battle royale game. That said, there was once a time when we didn’t have any vehicles at all. But, after the Shopping Cart, All Terrain Kart, and the hard-as-nails Quadcrasher. We might be getting another type of vehicle in the future, too: if the theories are correct, we could have aquatic vehicles by the time the Fortnite season 8 release date arrives. 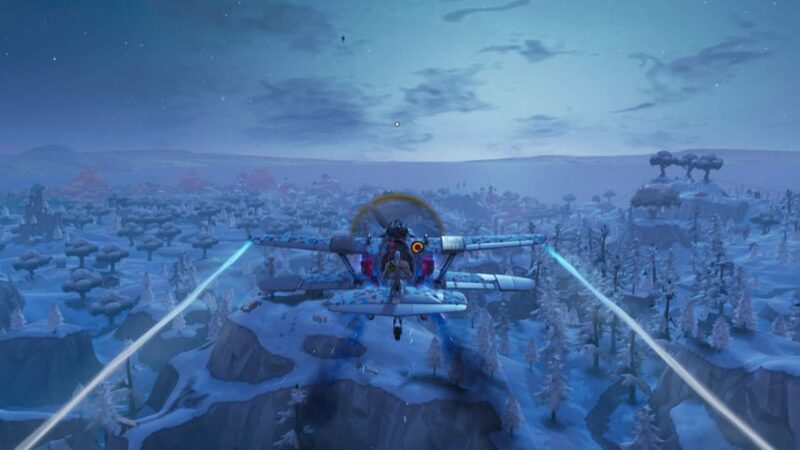 Anyway, back to Fortnite’s plane timed trials. We’ve had timed trials in the game before, so we have a good idea of what to expect. We’ve had them on foot to test our platforming and building skills, and raced the game’s other vehicles by road. So, all that’s to be sorted it out is where we can find that black-and-white flag/ethereal stopwatch. Without further ado, here’s how to complete and where to find all Fortnite Stormwing timed trials. So, the first question is: where can we find a plane with which to commence each trial? X-4 Stormwings pop up all over the map, but the most consistent place you’ll find them is next to Fortnite Expedition Outposts. These are bright red buildings dotted across the world, and at least one plane should be found right outside. 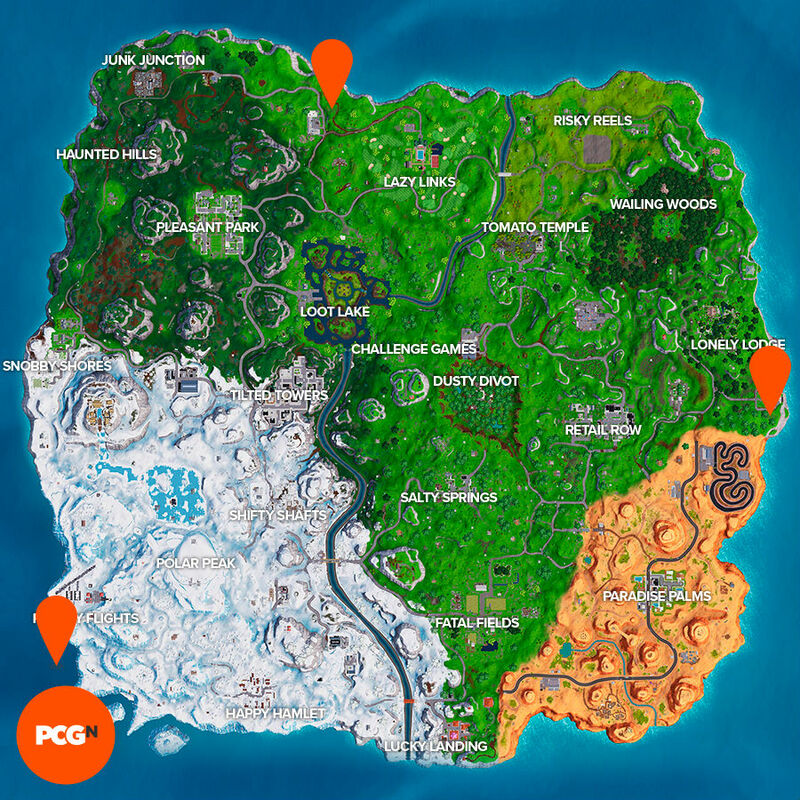 Five can be found in Frosty Flights, and one can be found near The Block and under the Fortnite abandoned mansion. Once you’ve got one, you need to get to the start line. When it comes to the races themselves, you need to find the stopwatch in the sky. Usefully they’re not as small the ones in previous timed trials, and they have a nice big ring round them acting as the start point. Once you’ve flown through that, more stopwatches will appear in front of you. Poke your plane’s nose through them with sufficient speediness to complete this mission. Also, make sure you’ve got to grips with the plane’s controls without getting shot down – getting Stormwing kills is actually a week 8 challenge so many will be keen to bring you crashing down. They’re pretty easy to pilot and they’re speedy at getting off the ground from take off, making quick getaways a cinch. The most important feature of the plane you’ll need for these plane timed trials in Fortnite will be, of course, boost. For PC players, the space bar is your friend here. And there you have it, everything we can possibly pass on to help you complete three timed trials with the X-4 Stormwing plane in Fortnite. There’s more week 9 challenge goodness where that came from, of course, so make sure you have popped ten Fortnite golden balloons and danced on a sundial, an oversized cup of coffee, and a giant metal dog head before they run out in a couple of weeks. In the meantime we hope you have a pleasant flight – preferably without that much gunfire.